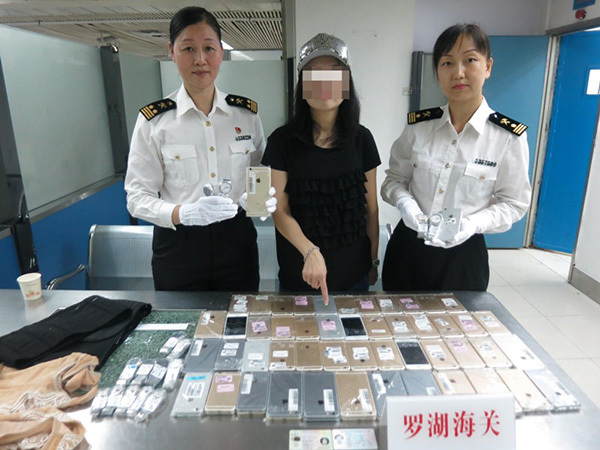 A woman has been caught as she tried to smuggle no fewer than 102 iPhones from Hong Kong to mainland China by strapping them to her body, according to reports. While the number is indeed higher than that of a failed attempt from last year that saw a Chinese man being caught smuggling 94 iPhones in a similar fashion, it pales into insignificance when compared to the 146 managed by a man who was caught back in 2015. Because iPhones are considerably cheaper to buy in Hong Kong than China itself, there is plenty of incentive for people to try and smuggle them across the border, and although we suspect people manage it plenty of times each month, this woman was picked out by Shenzhen customs agents after they noticed unusual bulges, pulling her aside for a search. When they conducted that search, they found 102 iPhones and 15 luxury watches on her, with a total haul weighing over 44 pounds. If you are wondering how much those 102 iPhones are worth, if they were the highest capacity iPhone 7 Plus models, then the woman would have been wearing almost $100,000 worth of smartphones on her person – and that is before you factor in the luxury watches that she also had with her, the collective value of which is currently unknown. Smuggling luxury items across borders is big business, and authorities do their level best to try and make sure that those attempting to make money off of the differing prices that things cost internationally don’t get away with it. While China and Hong Kong are far from the only two countries that have to deal with such things, being caught with over a hundred of Apple’s smartphones strapped to one’s person is currently an act that is, as far as we know, unique to the region. what is the penalty for this sort of thing? Nothing pisses me off more than the amount of money tax payers of almost every major country spend on the government’s ‘anti-smuggling’ enforcement. So ludicrous tax payers are so heavily subsidizing corporate profits. When I was a pre-teen and the Nintendo Wii came out, it was easily available in NYC but difficult to find anywhere else, so i bought a bunch and resold them on Ebay, but somehow it’s a national security issue if someone does the same thing across borders? This is stupid just like how marijuana is illegal in some states but not others.